How; is Honda brand fluid the best?, any filters?, how often? Just had mine replaced under warranty @ 28,000 miles, not a happy camper. Process appears very similar to auto trans fluid change. Most here use Honda ATF and I would suggest sticking w/ Honda CVT fluid. Pioneers of new models/equipment frequently have unpleasant experiences. Last edited by TexasHonda; 03-21-2014 at 09:18 AM. That previous linked video is equivalent to the U.S. Civics (96-00 Civic HX and 01-05 Civic HX and GX), which had CVT. Those earlier Civic CVT transmissions were different than the 2013-14 Accord CVT. The earlier Civic CVTs used Honda's 1st generation fluid, while the 2013-2014 Accord CVTs used Honda's 2nd generation fluid. The 2013-2014 Accord CVT does not have a transmission dipstick. On top of your CVT transmission is only a fill cap\plug (to add CVT fluid). 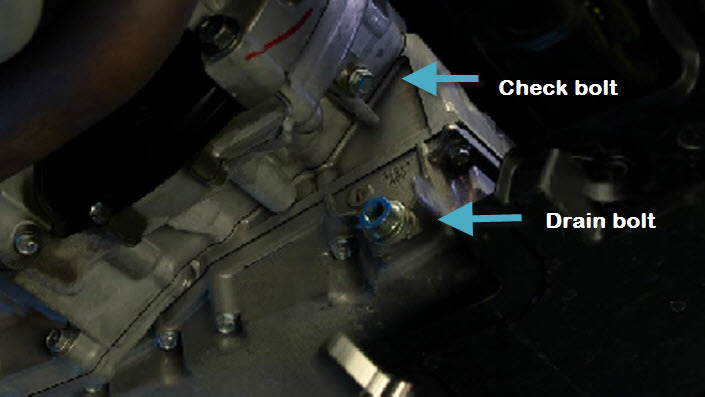 There is a Check bolt lower down on the transmission to check fluid level. It similar to checking fluid on a manual transmission. 1. Start car and warm it up to normal operating temperature (the radiator fan comes on twice). Shut off the car. 2. Jack up and support the car with jack stands. The car should be level when jacked up; so, you can properly check the fluid level afterward. 3. Remove the drain plug and drain the fluid. 4. Reinstall the drain plug with a new sealing washer. 1. Remove the filler cap (plug). 2. Refill with Honda HCF-2 CVT Fluid. 3. Install filler cap. The filler cap handle should be perpendicular to you if you're standing directly in front of the car. 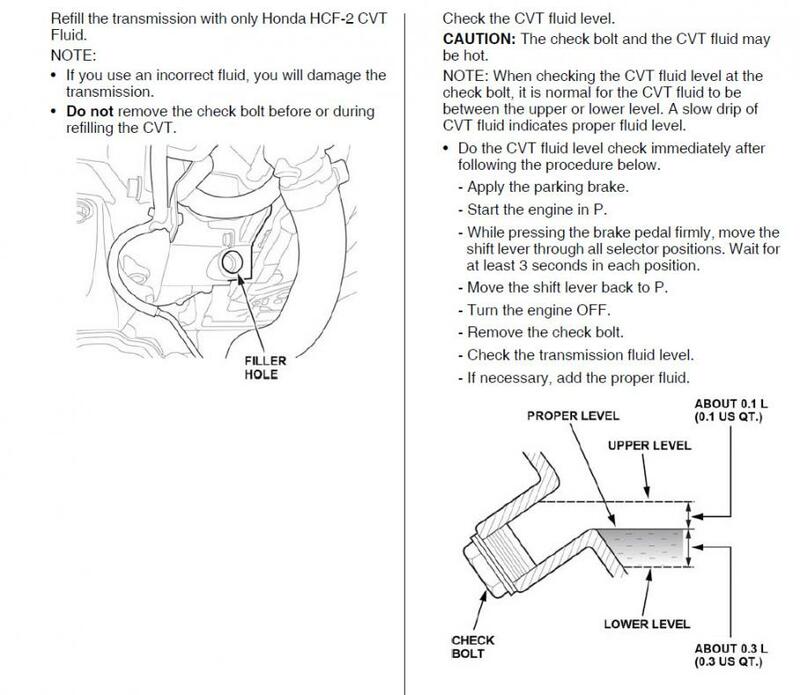 Note: Do not remove the Check bolt before or during refilling of the CVT. 1. Apply the parking brake. 2. Start the engine in P.
3. Move the shift lever through all positions while pressing the brake pedal firmly, and wait at least 3 seconds in each position. 4. Move the shift lever back to P and shut off the car. 5. 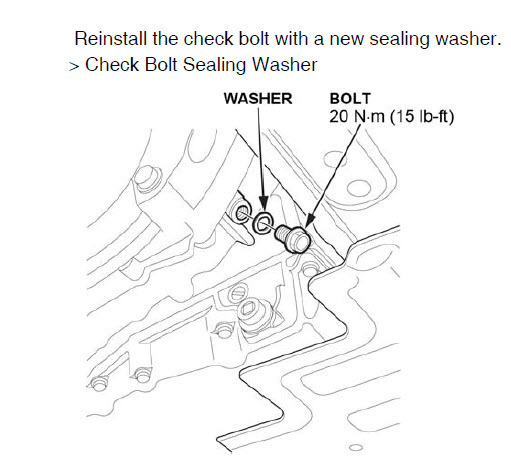 Remove the Check bolt and sealing washer. 6. The transmission fluid is at proper level if the transmission fluid is dripping from the check hole gradually (a slow and gradual drip). If the fluid is low, loosely install the check bolt, remove the filler cap and add fluid. Then repeat step #2. 7. With the fluid at proper level, re-install check bolt with new sealing washer. 1. Honda HCF-2 CVT Fluid is best for your car. 2. There is a filter strainer inside the transmission. However, that is not a normal maintenance item. 3. Your car has the Maintenance Minder and I am not entirely sure what the approximate mileage will be for maintenance sub-code 3. *5 Driving in mountainous areas at very low vehicle speeds or trailer towing results in higher transmission temperatures. This requires transmission fluid changes more frequently than recommended by the Maintenance Minder. If you regularly drive your vehicle under these conditions, have the transmission fluid changed every 25,000 miles (40,000 km). Everyone may have a different opinion; but, I personally would change the fluid about every 30,000 miles. 4. Some 2013 Accord with CVT did have problems related to a surge, hesitation, or judder on light acceleration from a Stop (Honda TSB 13-053). The fix was replacement with updated valve body and software update. Was your whole transmission changed or just the valve body and a software update? is it difficult to change your own oil and filter on a 2014 accord lx? how about the cvt transmission change interval and difficulty? any special tools required? 1. This video shows how do your own oil and filter change. You want to use jack stands to properly support the car after you jack up the car; for safety. Get decent tools as it makes a big difference in the difficulty of doing it yourself. For example, for ratchets, finer teeth gear (i.e., more teeth) allows for less room to turn the ratchet (e.g., Sears Craftsman Premium Grade has 84 tooth gear, which has more teeth than lower model Craftsman ratchets; many other brands also have ratchets with finer teeth gear). Longer handle allows more leverage. Six-point sockets and wrenches has less chance of rounding a bolt head, etc. vs. 12-point sockets and wrenches. 2. The CVT fluid change interval based on the Maintenance Minder may possibly 60,000 miles. I would personally recommend changing every 30,000 miles. Changing the CVT fluid yourself requires the car to be level to properly check and fill the fluid level; so, probably need to jack up the front and back and use four jack stands. To loosen the CVT drain bolt, you would use a 3/8" drive ratchet (w/o socket) to stick in the drain bolt and turn counter-clockwise. It probably will be relatively tight. The other instructions are what I posted previously in this thread. Last edited by redbull-1; 07-19-2014 at 10:08 AM. Thanks all for the help. With my camry i was able to use the thickness of 2 2"X12" chuncks of board to drive the front wheels on and the clearance was ample - we will see if i can do the same with the Accord. Also, is there a special break in oil in the new car? I can run the 4 cyl. Camry for 10,000 with full Synthetic, i wonder if i can do the same with the new 4 cyl Accord normal driving? With my camry i was able to use the thickness of 2 2"X12" chuncks of board to drive the front wheels on and the clearance was ample - we will see if i can do the same with the Accord. If you are going to do some of your own work on the car - engine oil, trans, ect....I would get quality tools. Two reasons, they keep you safe and make the job easy. Also for the trans fluid change the car needs to be "level". "Break in oil" - kind of a debate and I personally don't want to go there...please understand. Also, is there a special break in oil in the new car? I can run the 4 cyl. Camry for 10,000 with full Synthetic, i wonder if i can do the same with the new 4 cyl Accord normal driving? There is no special break-in oil per se. The factory-fill engine oil has molybdenum (“moly” for short), a special lubricant applied by the factory to critical engine components during assembly. Your car comes with Honda's 0W-20 engine oil, which is a full synthetic. Pretty much all the brands of 0W-20 out there right now is synthetic. You should follow the Maintenance Minder recommended change interval due to warranty coverage concerns though.